XR Geomembranes XR-5® used for 83-acre mining/ heap leach pad in Arizona. Location: San Manuel, AZ U.S.A.
A mining operation in Arizona is able to prevent seepage of caustic chemicals, thanks to XR-5® geomembrane's excellent flexibility and tough durability. The liner needed to be a flexible membrane that was durable, puncture resistant and able to retain caustic chemicals. The company selected lightweight XR-5 manufactured by Seaman Corporation in Wooster, Ohio. The 30-mil geomembrane material is stronger than most liners of its thickness; its breaking strength is 550 pounds per linear inch, the result of the scrim's weave which has 20 fibers per inch in each direction (compared to the standard of 10 fibers per inch). Chemical resistance is enhanced by the use of DuPont Elvaloy resin modifier over a base of DuPont Dacron polyester fibers, enabling the liner to reliably retain caustic chemicals while resisting the effects of weather and stretching. 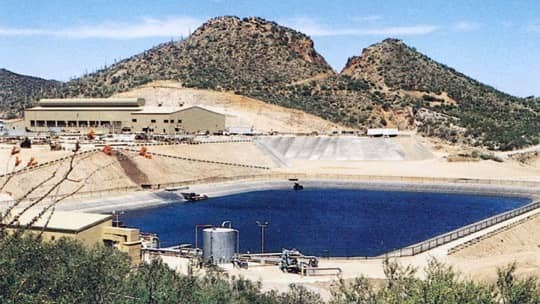 The copper mining operation at Magma Copper, San Manuel, Arizona, uses a heap leaching process to recover copper inexpensively. The recovery process employs a solvent extraction system using sulfuric acid and kerosene to extract minerals from ore. The ore is first showered on an impermeable surface where the leaching solution draws out the mineral content. The "pregnant" solution is then transferred to a mixing-settling tank where kerosene removes the copper. The copper is then removed from the kerosene by sulfuric acid to produce an electrolytic solution from which the copper is plated in an electro-winning process. Finally, the "barren" solution is re-acidified and sprayed back over another load of ore to complete the cycle. The 83-acre heap leaching pad, designed and constructed by Bechtel Civil and Mineral Corporation, puts the liner to the ultimate test. The chemical action of sulfuric acid, combined with temperatures reaching 160° F on the black surface, can seriously soften most liner materials. Dumping ore on the liner necessitates a strong membrane that is resistant to abrasions and punctures. And the steep, angular design of the collecting ponds requires a strong, flexible product. The leaching ponds, concrete reinforced structures, require the liner to be sealed around the edges at odd angles - a task simplified by the flexibility of XR-5. The XR-5 has more strength and less weight than other chemical-resistant liners. In fact, the 30-mil material is stronger than polyethylene three times thicker. With the ability to seam the fabric using thermal welding and factory fabricated panels of over 15,000 square feet, installation is quick and easy and field seaming is kept to a minimum.